Diesel Particulate Filter cleaning process. A guide to our safe, reliable process for cleaning filters. There are a variety of DPF cleaning products available both on the internet and via retail outlets. These are usually in the form of additives that claim to fix the problem. In general these products do not resolve the problem; they provide negligible improvement but rarely address the long-term issues. Our DPF cleaning procedure has been developed with the assistance of one of the world's top 100 universities, using specially developed chemical products that are designed to work at lower temperatures. Once we receive the DP filter at our workshop we will perform a thorough inspection of the unit both externally and, utilising an endoscope camera, internally to assess the problem. The next stage is to connect the filter to an Airflow Meter to measure the exact throughput of the unit. The filter is then connected to our thermal cleaning system which uniformly heats the filter whilst at the same time injecting the chemical treatment that we have developed. This stage takes approximately 2 hours to complete. We then connect the filter to a high pressure airline which cleans out any residual ash, the end result being a clear and clean filter. The final stage is to re-connect the filter to an Airflow Meter to check the throughput and then insert the endoscope camera for a visual inspection. 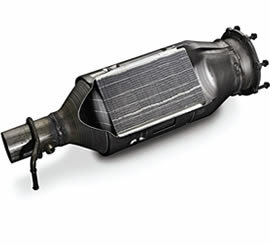 We will collect the DPF filter from you and return it to you usually within 48 hours. NOTE: It should be noted that you may need to have the ECU reset once the DPF has been refitted. Your nearest reputable garage could do this for you or DPF Cleanse can reset this for you for a small fee at our workshop, located a few minutes' drive from Manchester, Bury or Bolton.